Have you ever experienced a situation where you got a notification that Kingo Root app in not installed. However, you are sure that you have downloaded and installed it. The most people usually will be panic if something wrong with the apps. So, to make them not panic when facing this problem, how to fix it? You need to know the reasons of why this error can happen. However, you need to know that rooting an android phone goes against warranty and it is often not advised by android. It is a measure to get root access to your phone. Since by default, android does not support this process. 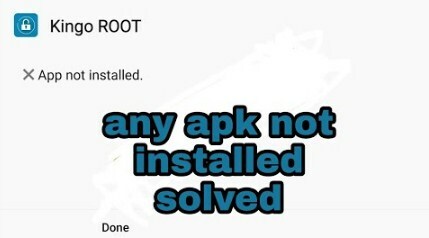 Rooting apps such as iRoot, Kingroot, KingoRoot, Framaroot and the other rooting apps look for all exploits on the device to be able to root it and it includes codes and the likes. Upon attempting to install the app, android security detects this and often advises against installing them. So, that’s why installing these apps often do not cause any issues, without proper guidelines and you are prone to experience the app not installed error. So, how to fix KingoRoot app not installed? First, on your android, you have to Enable Installation of Apps from Unknown Sources. Android does not permit installation of apps from third party sites or external sources other than Google Play Store because installing and launching a malware infested app can cause harm to your phone. To enable installation of apps from external sources on your android, you need to navigate to Setting > Security on the android device. Then, check the option “Unknown sources”. After that, tap OK on the prompt message and then choose “Trust”. Downloading Rooting APK Apps from Original Sources. In this section, you want to make sure that you are downloading the app from a trusted source. Downloading from their official websites is often trusted places to download these apps. You need to do Installation Technique To Bypass Unable To Install App Error. If you just go ahead to install the KingoRoot app without following this guidelines, you will be faced with the KingoRoot app not installed error. This error is usually faced on devices running Android marshmallow OS and Nougat. So, there are some steps to guide to bypass the unable to install app error and successfully install the apps. First, you have to select to install the app and you will most likely be faced with an Installation blocked pop up. Then, tap on More Details on the installation blocked pop up. Therefore, it is stated that it is harmful to install an app from an unknown sources. After that, tap on install anyway. At this stage, the app will try installing and after a few seconds, you need to get the app installed notification. Well, you are able to do these methods to fix the error of Kingo Root app not installed error. You are also use this methods to fix the same problem when you use other root apps such as KingRoot, FramaRoot, iRoot and any other root apps. Related Post "Kingo Root App Not Installed"